A centuries-old spirit from South America is experiencing a renaissance in bars across America, reviving with it an equally old argument regarding its origin. Welcome to the pisco wars of 2013. The birthplace of pisco -- a grape brandy created by Spanish settlers during the 16th century -- has long been a point of contention between Peru and Chile, which both lay claim to it. "The Spanish brought to the territory of the Inca empire not only the art of winemaking, but also the art of distilling," said Claudia Olmedo, a Chilean pisco sommelier. "In the northern, semi-arid region of Chile they found special conditions to produce the spirit, including the climate, artisan labor, clay to make containers, and, of course, copper to make the alembic pot stills." But if you ask a Peruvian, he or she will likely point to the town of Pisco, which historically served as the major international port for the brandy because of its close proximity to Peruvian vineyards. They also point to artifacts: A museum exhibit in Lima earlier this year centered around the spirit, displaying as its centerpiece the last will and testament of a wealthy merchant named Pedro Manuel that included more than 100 mud containers and jars filled with pisco, as well as a large copper still. Dated April 30, 1613, it is considered the oldest known piece of evidence of pisco production in Peru. Fortunately, American mixologists don't have to take sides unless they choose to. Steve Olson, a noted liquor expert in the U.S., has worked with pisco producers in both countries over the years and takes an inclusive approach to stocking his bar at APT-13 in New York City. "There are some outstanding piscos made on both sides of the border between the regions of pisco production, which just happens to divide Peru from Chile," said Olson. "My favorite pisco to make cocktails with is Kappa, which is very aromatic, made from muscat grapes in the Elqui Valley of Chile." "That said," he added. "It is my opinion that a good bar should have at least one pisco from each country. ... I will usually stock an acholado or a quebranta from Peru, so I represent the opposite ends of the spectrum." 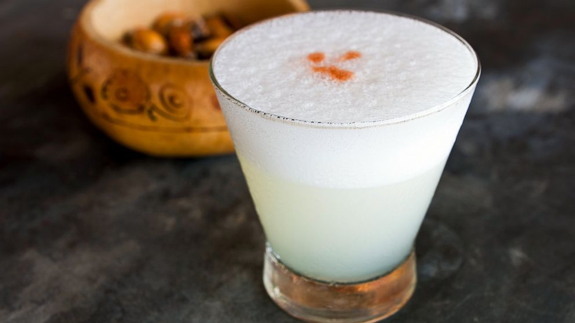 The pisco sour, a cocktail enjoyed by both Peruvians and Chileans, is the most classic way to experience the spirit. Jessica Maria, co-proprietor and head bartender at Hotsy Totsy Club in Albany, Calif., adjusted the pisco sour recipe she enjoyed in Peru to lighten it up for the American palate. "I use 2 ounces pisco, 1 ounce of lime juice and 1 ounce of simple syrup, then add the white of one egg, shake it really hard and top it with bitters," she told ABC News. "In Peru, they make it with a 3-1-1 ratio and use a blender. That's easier for the home bartender and it gets that nice, rich foam people like." Todd Thrasher of Restaurant Eve, PX Bar and TNT Bar, in Alexandria, Va., was recently named a pisco ambassador by the Peruvian government and La Diablada, a Peruvian producer. He takes a more ambitious approach to pisco, which he loves for its versatility, he said. "I made my own duck sauce from scratch and turned it into a soda, then combined one ounce of pisco and a half ounce of anejo tequila," Thrasher told ABC News. "I shake it together and then serve it up with more duck sauce soda and garnished with fried shrimp cracker. It's completely off the wall."